Updated & ready for new owners:New roof in 2016, insulated crawl space in 2019, dual zone HVAC with a gas hybrid system on the main level installed 2009 & heat pump on 2nd floor installed 2012, updated kitchen & bathrooms, beautiful patio with large deck to enjoy the park like .54 acre lot. Neighborhood amenities include: swimming pool, clubhouse & tennis courts. Light & bright 3 bedroom, 2Â½ BA home features wood flrs throughout the main level with dental crown molding. Open concept living & kit is perfect for entertaining guests. 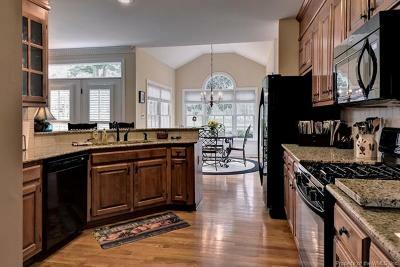 Kit w/granite countertops, gas stove & beautiful cabinetry. LR has gas FP & transom windows. 2 sets of stairs lead to the 2nd flr which has a bonus rm w/a built in desk. The MBR has a large w/i closet & en suite master BA w/granite countertops, large walk in tile shower, oversized jetted tub & double sinks. Two additional bedrooms & laundry are also located on the second floor. Minutes to shopping, grocery stores, restaurants and popular Newtown District. Seller offering 2-10 Long and Foster Home Warranty with acceptable offer. Subject to a ratified contract w/contingencies. Owner wishes to continue to show the property and will consider other offers.